According to Jason Forston, Executive VP of marketing and sales at Texas Armoring Corporation, NFL security has been in talks with his company for the purpose of building armored cars in bulk for players. Following the shooting of Jacksonville Jaguars' Richard Collier last week, no doubt agent-driven interest in armored cars for NFL players has spiked, with Texas Armoring gettin' much of the spotlight. Their products feature all the gadgets a junior James Bond could want in a ballistically protected, Hummer shaped package. Heck we'll let them tell you all about it below. SAN ANTONIO, TEXAS–September 9, 2008 – Texas Armoring Corporation, a leading worldwide supplier of armored passenger vehicles, announced today that the company has been in contact with key security personnel affiliated with the National Football League (NFL). Following the recent attack on Jacksonville Jaguars Offensive Tackle Richard Collier, representatives of professional athletes and their security staff have reached out to Texas Armoring Corporation to provide them with custom bulletproof car solutions. According to the company, approximately 80-90% of attacks occur while victims are traveling by automobile, thus a bulletproof vehicle is the first line of defense for individuals in the public eye. “We’re saddened by the unfortunate violence against Mr. Collier last week and by similar attacks against NFL players during the last 18 months. We’re confident that our products can offer some peace of mind to other players and their families in the coming weeks and months as they obtain our vehicles,” remarked Trent Kimball, President and CEO of Texas Armoring. Kimball continued, “In reality, professional athletes and celebrities are prime targets for attacks. Because of this, we are working with a number of high-profile clients who are following the examples of public figures like Tom Cruise and David Beckham by acquiring bulletproof cars for themselves and their loved ones. 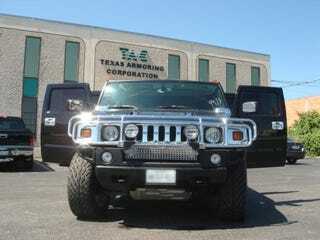 My family has been in this industry for over 30 years, and Texas Armoring Corporation can armor nearly any vehicle custom to our clients’ specifications. Mercedes Maybachs, Cadillac Escalades, Range Rovers, and other luxury models are our specialty.” In addition to offering armored bulletproof cars and SUVs to the NFL, Texas Armoring announced that it has retained the exclusive services of two former CIA operatives to help athletes and celebrities with a wide range of security services. While the personal details of the agents remain confidential, the two former operatives have operational experience in over 50 countries and are experts in private/commercial security, surveillance, and counterintelligence offerings. Both are veterans of the CIA's Directorate of Operations with field tours in the Far East, Middle East, Europe, and Latin America and domestically in the U.S. The former operatives have extensive private sector experience as senior consultants to corporate clients at the Fortune 50 level in the areas of executive protection, threat identification and mitigation, specialized training and as “first responders” in kidnap cases. Of the partnership, Kimball said, “The pair of former operatives we’ve retained has over 40 years of experience worldwide. They’re experts in foreign intelligence operations, security program management, physical security, risk assessment, contingency and disaster recovery planning, and crisis management. Basically, this means that now Texas Armoring can send out highly-trained James Bond/Jason Bourne-type consultants to our clients’ places of work and private residences for a professional threat assessment to point out areas of weakness and make recommendations to improve security.” Having conducted hundreds of threat assessments and specialized training exercises in surveillance and counter-surveillance operations to ensure operational integrity under difficult conditions, the two will apply their expertise to protect Texas Armoring’s exclusive clients, their families, organizations, personnel and assets against foreign and domestic threats. With regard to the announcements, Kimball concluded, “Overall, our goal is to protect NFL players and others in the spotlight with all of the resources at our disposal—the first step being an armored vehicle and the second, a professional threat assessment. We hope that other professional organizations will follow suit so that we can provide protection through bulletproof vehicles and threat assessments to members of the NBA, NHL, MLB, etc. The bottom line is that the type of violence that Richard Collier was subject to last week is intolerable, and Texas Armoring Corporation will continue to do everything in its power to protect high-profile athletes and celebrities from such shameful acts of violence going forward.” About Texas Armoring Corporation Texas Armoring Corporation is a leading worldwide supplier of armored passenger vehicles and bulletproof cars. The firm’s origins date back to the 1970s when key staff members pioneered the bulletproofing industry through producing bulletproof cars for world leaders. For more information on armored vehicles and Texas Armoring Corporation, please visit http://www.texasarmoring.com or call 210.333.0211.